Broken drains can be repaired easily in hours with our high-tech drain relining repair process where previously a drain might have to be excavated and replaced. Partially collapsed, deformed or heavily blistered pitch fibre drains can be reshaped and then structurally reinforced using a “cure in place” liner. After this work is completed the drain is restored to its original shape and ready for use. 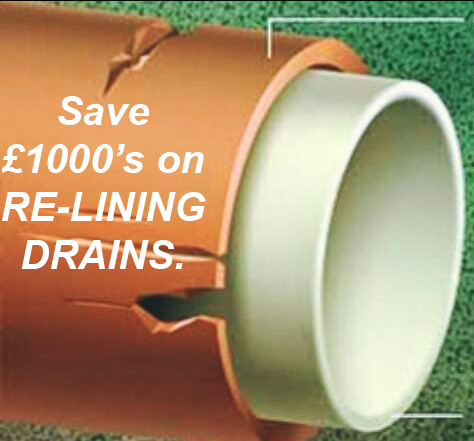 Ceramic drains can also be lined to prevent further deterioration of fractures stopping leakage into the surrounding ground and the possibility of subsidence. A liner installed in a clay drain will also prevent the intrusion of tree roots. Drain re-lining can in most cases be carried out without extensive drain or sewer excavation and normally only takes a few hours to perform.